Alix Korey was born on May 14th in Brooklyn, N.Y., a birthday she shares with the state of Israel, although Israel is older by several years. Also older by several years is Susan Sarandon, which signifies nothing but makes Alix happy to think about. At the age of 6 weeks, she was taken on her first pediatrician’s visit, was kept waiting and commenced screaming for attention. The doctor is reported to have said, “That is the largest pair of vocal chords I’ve ever heard on a 6-week old.”, and Alix’s mother replied, “Slit them.” The doctor, of course, thought Mom was joking and didn’t. But, perhaps it forebode her career as a belter, and it certainly forebode some therapy for Alix. Her first public performance was at age 4 singing “In the Shoemaker Shop” prior to a children’s ballet recital in Springfield, Illinois, which is only remembered for Alix’s singing to the upstage curtain on which she’d discovered she could make shadow pictures with her hands. The ballet school spelled her name wrong in the program. In the fifth grade, Alix auditioned for the school musical and sang like a very sweet soprano. She was cast in the chorus, while Andrea Wolf got the lead because she yelled her song at the audition. Alix went home, listened to her Judy Garland recordings, and from then on, got the leads in all the school musicals through high school. Alix went to Barnard College, graduating early because she hated it there. While there, she continued studying dance (begun at the age of 5), voice (begun at the age of 16), and began studying acting with the man who became her mentor and friend till this day, Aaron Frankel. She owes him much. Between her college semesters, she did several summers of stock which she remembers with great fondness (even at $25 a week) and ended up with something of a truthful résumé when she graduated. Her first theatre job out of school was at an off-off-Bway house called the Mercer Arts Center. She played Voglinda in Jim Steinman’s rock musical version of DAS RHINEGOLD, featuring choreography by budding playwright Wendy Wasserstein. Just weeks after RHINEGOLD closed, the Mercer Arts Center collapsed into rubble, but Alix did not take that as a sign of………well, anything. Alix’s first Equity show was the bus-and-truck tour of TWO GENTLEMEN OF VERONA, a nightmare from beginning to end. Offer her a cosmopolitan and she’ll tell you stories that will curl your hair. Despite these inauspicious beginnings, Alix continued on and made her Broadway debut as Minnie Fay in the 1978 revival of HELLO, DOLLY!, starring Carol Channing. The result of that experience (also hair-curling) made her run for Equity Council in 1980, on which she served for an extremely rewarding 15 years. In 1987, Alix and four other councillors formed the Equity Fights Aids Committee, later to become BCEFA on whose board she served with pride and joy for many years. Bless you, Tom Viola. 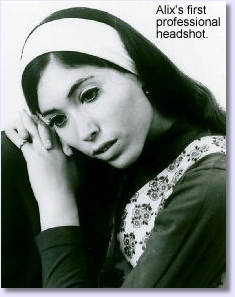 In 1980, as predicted by an astrologer 6 years earlier, Alix became a household name as the actress in PIRATES OF PENZANCE who got hit by a bicycle in Central Park and suffered a severe skull fracture; not as the TV star she had envisioned when celebrity was predicted. However, PIRATES became her one and only hit (out of 7 B'way shows) when it opened on the Great White Way in 1981. Please see her résumé for the whole story. 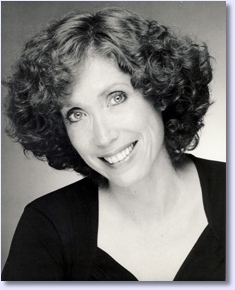 In 1982, on tour with Donald O’Connor in SHOW BOAT (Ellie May Chipley becoming her least favorite role), she met the love of her life, Randy Hansen, and they married four months later at the Alta Mira Hotel in Sausalito. They will celebrate their 25th wedding anniversary this year. In the 1990’s, Alix discovered her second passion in life; teaching at CAP 21 as part of the NYU Tisch School of the Arts. Along with family and close friends, her students became the dearest treasure of her world. She misses them all, and if any of them are reading this, let mother know how you are. So, if you’ve checked the résumé, you know Alix’s last B'way show was ALL SHOOK UP. Since it was the best theatre experience of her life, she decided to leave NY on a high note and is currently living on the West Coast with her new bichon, Lizzibeth. She misses her friends and students very much and asks only that everybody be kind to each other.